This passage from Matthew is a response to horrific injustice. King Herod, learning from the Wise Men that the King had been born, is unable to locate the specific child that represented a threat to his Power. So to play it safe, he draws a circle on his map around Bethlehem and uses the legitimate authority of his government to execute all boys under two within that circle. It’s understandable that Christmas pageants end with the arrival of the Wise Men. It makes a nice conclusion to the story. Very Important People “traverse afar” to acknowledge the King and humble themselves before Him. Clearly, power bends in the face of the Incarnate God. But that’s not the whole story. Power is also used to exterminate innocents. Undeserving others who happened to be born in the wrong neck of the woods. Who couldn’t have possibly have been born just six months earlier so that they’d be over two when that horrific order came down. Thursday night we finished my “Spirituality, Faith, and Justice” class. The students recognized that power and our response to it was a central theme to all of our readings. (They also rightly pointed out that I probably intended that since I picked the books and ordered the readings.) By the end of all of our books, a quest for power had given way to something else. Michael Sandel was calling for a communitarian response to the common good. Christena Cleveland calls us to a broader circle of identity and a commitment to serve others in response to Christ’s model. David Fitch and Geoff Holsclaw call us to practice Incarnational Pluralism, where we engage the communities in which we live to bear witness to the Kingdom. I have no wish, mutatis mutandis, to draw too close an analogue to our own time or to overstate the totalizing aspects of the present American system. Except to notice that the present concentration of power and wealth among us, the collusion of much of the media, and the alliance of the courts make it possible to think that totalizing is ready at hand among us. Those of us who attend to and mean to adhere to the testimony of truth in the biblical tradition are left with the quite practical question concerning the performance of truth that concerns emancipation and transformation in a context that does not intend any emancipation from dominant ideology and that intends transformation only inside that system. The wonderment among us is that there are agents of truth who find daring, risky ways out beyond the totalism. Sometimes (many times?) the church colludes with the totalism and blesses it, to its own considerable benefit. But sometimes the church— in feeble or in daring ways, in conventional or in imaginative ways—has an alternative say….It is finally the God of all truth who breaks the grip of totalism, who confounds the imperial governor, and who makes all things new … here and there … now and then. A society that has lost its way may indeed be ready for serious discipleship that informs citizenship. Such deep obedience to the truth that marks discipleship does not aim, in citizenship, to transpose the body politic into the church or into a theocracy. It aims rather to insist that the holy truth voices gifts and commands that matter in a society that depends too much on greed against neighbor, that practices too much denial about the crisis in the neighborhood, and that ends too much in despair. It occurs to me that the situation of the church in our society, perhaps the church everywhere always, is entrusted with a truth that is inimical to present power arrangements. … The truth that is variously enacted by such agents is not an idea or a proposition. It is rather a habit of life that simply (!) refuses the totalizing claims of power. Naturally, all of this thinking about issues of power leads me to reflect on Ferguson and Staten Island. How can grand juries fail to indict bad behavior? If we think about the totalizing aspects of power, it would be naive to expect an indictment. That would require the entities of power ruling against the agents of power. Sure, we can find cases where “bad apples” are isolated and removed, but that does little to disrupt the power involved. The protests in the streets across the nation has been a fascinating display that people think “something is wrong”. But some of those protests have been designed to compete within power domains. Perhaps, they seem to suggest, if we disrupt shopping malls or traffic patterns, then change will come. But often that simply turns into an invitation for contesting power that plays into the hands of those who wield it most effectively and who have more structural resources upon which to draw. So where does that leave us? If power is not the coin of the Kingdom, how do we nurture change and justice? Again, it’s worth reflecting on what happens in the midst of lament. As I’ve noted before, Brueggemann suggests that when the Israelite slaves cry out in their Egyptian oppression, God acts — even though they don’t ask God for deliverance. Our presence and participation in the pain of others is more of a testament to Truth than dozens of organizations or twitter hashtags. God is also present in the suffering. In Pastrix, Nadia Bolz-Weber reflects on the perrennial question of theodicy: where is God in suffering? Her answer is remarkably simple: he is on the cross. He is incarnationally present in the midst of the pain. One of my favorite parts of Frederick Buechner’s Wishful Thinking comes as he’s discussing Job’s suffering. Buechner suggests that we often want explanations of how these bad things happen. Who is to blame? What is the point? He also suggests that God is simply present in the pain. Understanding in terms of the divine economy why his children had to die, Job would still have to face their empty chairs at breakfast every morning. Carrying in his pocket straight from the horse’s mouth a complete theological justification of his boils, he would still have to scratch and burn. God doesn’t reveal his grand design. He reveals himself. He doesn’t show why things are as they are. He shows his face. And Job says, “I had heard of thee by the hearing of the ear, but now my eyes see thee” (Job 42:5). Even covered with sores and ashes, he looks oddly like a man who has asked for a crust and been given the whole loaf. The Truth is that God’s Presence is there in the midst of the crowds in Ferguson and Staten Island and everywhere else. He has not abandoned the world. And we in the church, acting as the Body of Christ, are similarly present. We are vicariously suffering the loss of lives and the pain of incredulity that such things happen. It’s worth looking back at the Jeremiah passage that Matthew quotes following the Slaughter of the Innocents. The very next verses, Jeremiah 31: 16-17 say that God is aware of the suffering and that things will soon be different. They will return from the land of their enemy! Your children will return home! Maybe we need to include Herod in the Christmas pageants somehow. Maybe it would let us stay aware that we’re not about trusting in power, even when it’s ours to exercise. Maybe it’s worth reminding ourselves every year that Truth is playing on a very different level than simple Power. I’ve often wanted a different ending to the second chapter of Matthew. 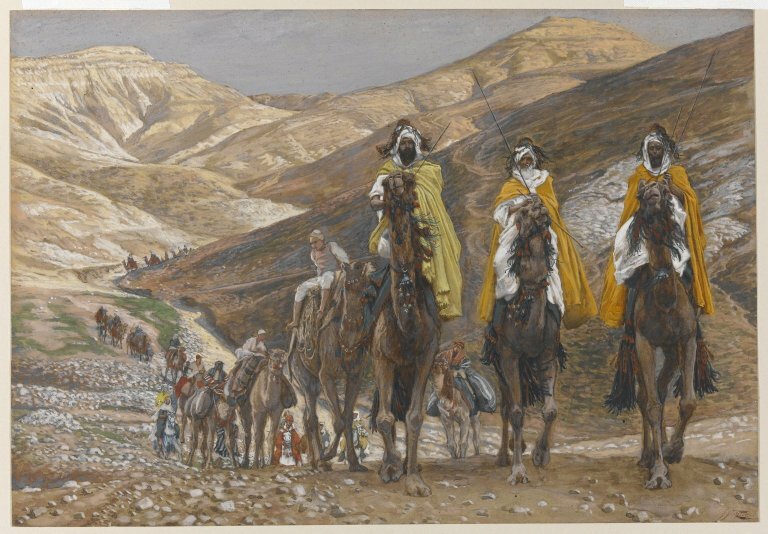 The Wise Men are “warned in a dream” not to return to Herod. I kind of want them to go back and then refuse to tell where they find the Child. It would have cost them, but maybe would have saved those children. But it’s not my story to write. It’s God’s. And as one of his ambassadors, maybe it’s enough for me to live in the tension and pain of loss. To suggest that there is another way. That one day, hopefully soon, we will all be returning home from the totalizing power of Empire into the reward of the Kingdom of God.